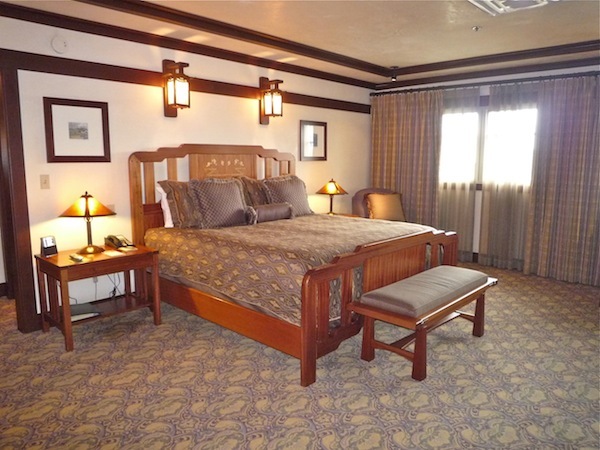 One of two Presidential Suites at the Grand Californian (the other is the El Capitan Suite), both strongly suggestive of the Mission style seen throughout the resort. The Mt. Whitney Suite is embellished throughout with warm tones of green, brown, and gold, all reminiscent of nature. 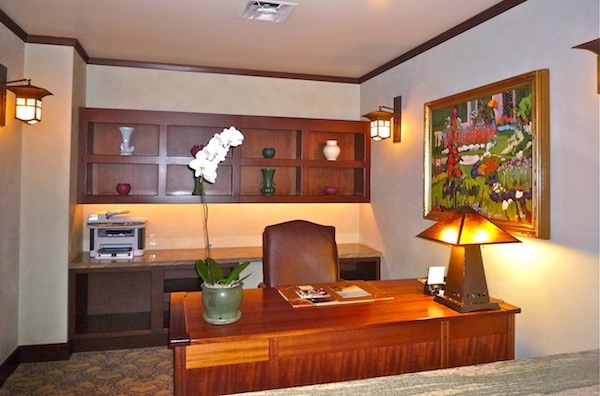 Off one side of the entry hall is a half bath; and on the other an office with an oversized desk and credenza. 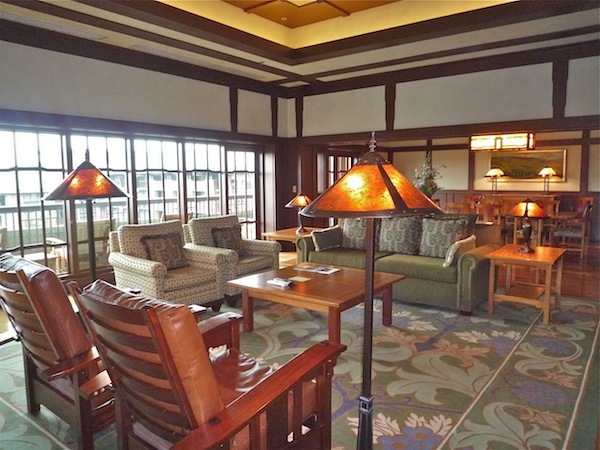 In the massive living room is lovely hardwood flooring, glowing fireplace, forest green sofa, and four easy chairs, two of which are Morris-style leather chairs, all flanked by amber-hued Craftsman standing lamps. As part of this “great space” is a dining area seating eight over which hangs a stained glass fixture; a service kitchen is nearby with full-size refrigerator, sink, and microwave. 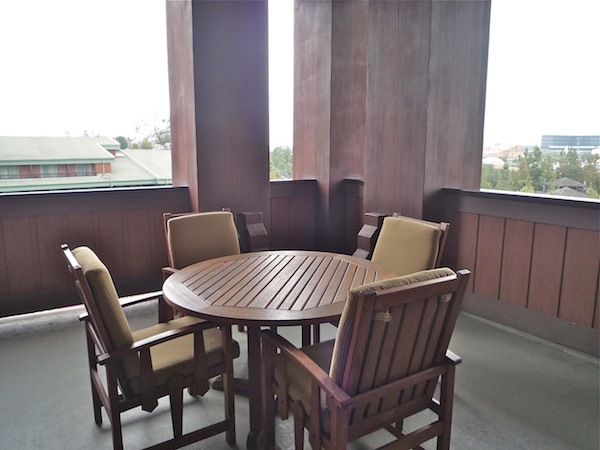 My favorite aspect of the suite is its outdoor space with a balcony the entire length of the suite as well as a gem of an eating porch (even an outdoor fireplace!) perfect for al fresco dining. And even more perfect is the superlative view of the resort’s pools and California Adventure park with semi-views of the World of Color show. The grandeur of the living area outshines the somewhat low-keyed master bedecked in moss green and lilac hues. The furnishings of a king bed, easy chair, desk, bureau, and entertainment center almost seem a bit lost in the spacious room. Pass on through a small walk-in closet where a vanity area divides a two-part master bath: on one side is a single sink, whirlpool tub, bidet, and commode; on the other side an oversized marble shower, single sink, and a separate commode area, all enhanced with Carrera marble and mosaic flooring. An additional bedroom with two queen beds can be added to make a 2-bedroom suite sleeping eight guests. Cara Goldsbury is the author of The Luxury Guide to Walt Disney World Resort. She is Chief Executive Concierge at Glass Slipper Concierge and has appeared as a leading Disney expert on two Travel Channel specials, Disney Splurge! and Disney Royalty. She has also been cited numerous times in national news articles, in such notable publications as Forbes Traveler, as an expert on the Walt Disney World® Resort.